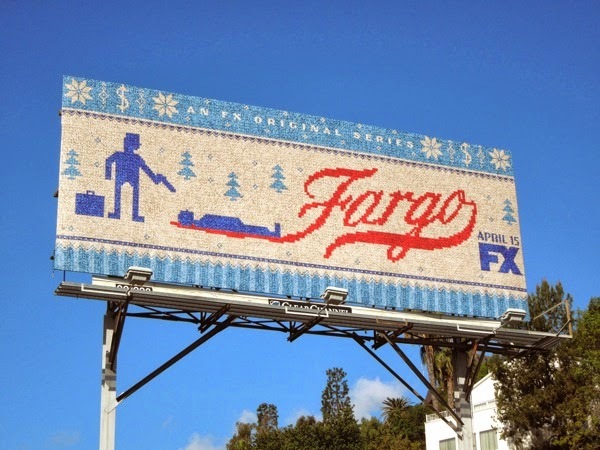 Welcome to another TV WEEK here at Daily Billboard and to help kickstart the themed week of new and returning shows, it's television spin-off time again with FX bringing the world of the Coen Brothers 1996 movie Fargo to the small screen. The new crime drama set in North Dakota will feature a new case and new characters, but the same dark comedy and graphic violence that made the original film a hit. The TV remake will star Billy Bob Thornton, Martin Freeman and Allison Tollman as an ambitious rookie deputy police officer, that will no doubt evoke the wonderful Frances McDormand's pregnant character from the movie. 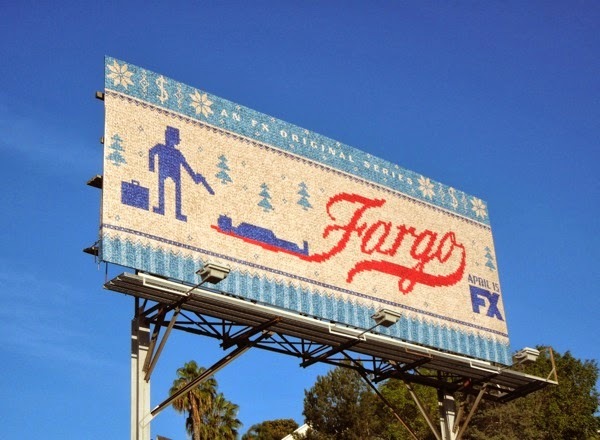 This needlepoint-style launch ad creative for the 10-part Fargo series is perfect for the quirky nature of the black comic drama, which will explore relationships as well as the bloody business of murder. 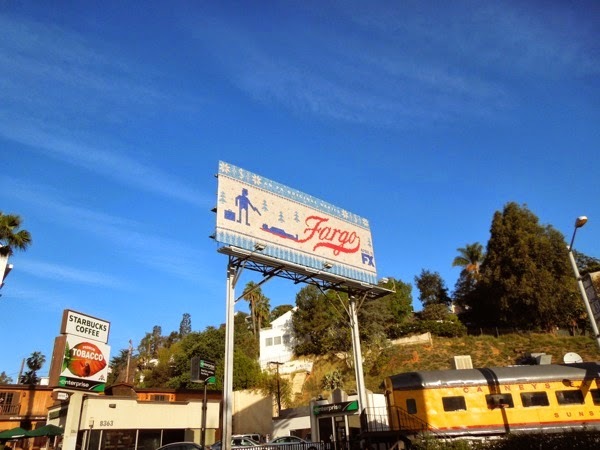 These series premiere billboards for Fargo were spied along the Sunset Strip and along Beverly Boulevard on March 26, 2014. 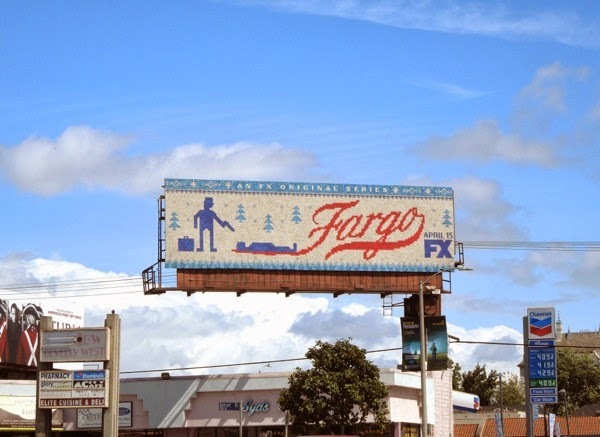 Often it takes TV shows a few seasons to hit their creative stride when it comes to series promo billboards, but FX has clearly nailed this offbeat creative for the new show. 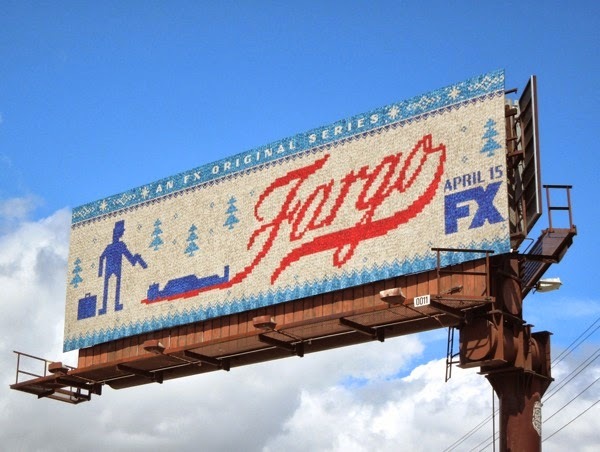 If you like this billboard design, you may also like these billboards for Cinemax's Banshee which also took a different non-traditional approach with an illustrated ad creative. 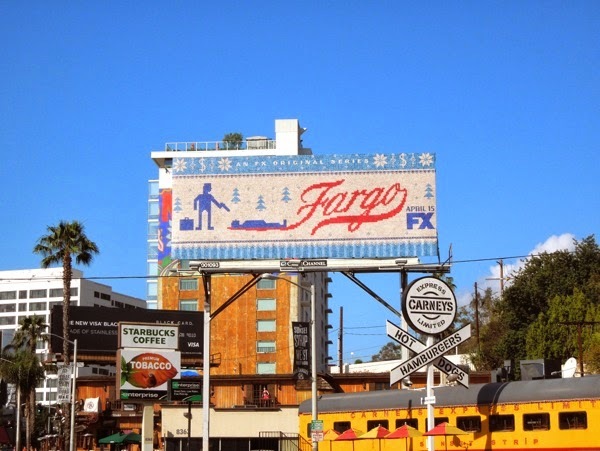 Stick around in the days to come for even more cool billboards for debuting TV shows and returning series.